ARVID ARTHUR SCHULTZ passed away at the Chinook Regional Hospital on Wednesday, November 21, after a brief illness, at the age of 78 years. He is survived by his loving wife of 53 years, Frances Schultz; by his four children, Henry Schultz (Sheelagh Mercer) of Calgary, Linda Schultz (Barry Rosser) of Florida, Arthur Schultz (Sara McNeill) of Edmonton, and Maria Schultz of Lethbridge; and by his nine grandchildren, Griffith, Frances, Nicholas, Katherine, Jeremy, Rachel, Patrick, Zachary, and Gemma. He is also survived by his brother Bruno (Joan) Schultz, and sisters Irene (Barry) Ferguson and Florence (Gordon) Miller; by his brothers-in-law Frank (Ollie) and Bill Sharp, and his sister-in-law Bonnie (Bob) Sharp; and by his ‘adopted’ family of Tammy, Jim, Morgan, and Eden Gresdal. He was predeceased by his parents, Henry and Linda Schultz, his step-mother Tilly (Ressler) Schultz, his sister Joyce Ressler and brother Fred Ressler, and his brother-in-law Bob Sharp. Arvid was born on July 10, 1934 at home on the family farm at Bashaw, Alberta. He graduated with a B.Sc. (honours physics) and a M.Sc. in physics from the University of Alberta, and with a Ph.D. in nuclear physics from Queen’s University in Kingston, Ontario. After completing his Ph.D., he spent two years on a post-doctorate fellowship at the Franklin Institute on the Swarthmore College campus in Pennsylvania. Upon return to Alberta, he was hired to teach physics at the Lethbridge Junior College. He was a founding member of the University of Lethbridge and the Physics Department. Teaching was always his focus at the university. 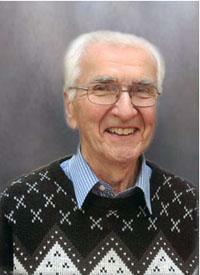 He retired from actively teaching in 1990, but always kept strong ties with the Physics Department. He volunteered many years in astronomical research, travelling numerous times to Hawai’i and to Kitt Peak in Arizona. In 2011, an award allowing students to sample a variety of areas in physics research was named in his honour as The Arvid Schultz Award. He married Frances Alice Sharp on July 11, 1959. After moving from Kingston to Philadelphia to Bashaw, the family settled in Lethbridge in 1965 when Arvid started teaching at the Lethbridge Junior College. In 1971, the family moved to the farm west of Monarch. He farmed part-time for a number of years, raised a small herd of Brown Swiss cattle, and helped plant many trees and gardens. He took great pride in the land, maintaining the trees and native grasses to support a wide variety of bird and animal populations. His love of learning, commitment to community, and record keeping was a common thread for his varied interests and passions. He was a founding member of the Lethbridge Naturalists Society, and was actively involved, holding a number of offices over the years. He participated in Highway Clean-up with the Lethbridge Naturalists Society, extending this to keeping his walking routes down country roads clean. For many years, he volunteered with others to undertake the Breeding Bird Survey for the United States Department of the Interior. He donated blood to the Red Cross and later, the Canadian Blood Services, reaching a total of 124 donations, just short of his goal of 125. He kept weather records for Environment Canada from early years on the farm until the present. He had an avid interest in photography from the time he was a student. As well as photographs of sunrises and sunsets, mountains, stars, the northern lights, and astronomical events, he documented gatherings with family and friends including weekly lunches with university retirees. While a student in Kingston, he earned his private pilot’s license. Some of his other passions included walking a mile every morning and evening, and dancing with Frances at many local ethnic society dances. The Southern Alberta Council on Public Affairs became a weekly highlight for him with new friends and new ideas to explore and discuss. He took on the role of organizing weekly lunch dates for the University Retirees, enjoying the fellowship of fellow retirees, while exploring the ethnic food choices of the city of Lethbridge. “In Memory Of Arvid” donations may be made to an Arvid Schultz Memorial Fund at the University of Lethbridge (c/o Kathy McFarland), the Southern Alberta Council on Public Affairs (Box 651, Lethbridge, AB, T1J 0N0) or the Helen Schuler Coulee Centre (910 4th Ave. S., Lethbridge, AB, T1J 0P6). Born in Indian Head SK, only child of Flora (Fraser) Mills (Hamiota, MB) and Arnold Mills (Oxbow, SK). He attended schools in Bremner, Medicine Hat and Lethbridge AB. Bill was awaiting deployment from Halifax, when WWII ended. Returning to AB, Bill completed surveying courses, then followed his wanderlust, working for the railroad, seismic crews, along the Alaska Highway, and as a cowboy in the Fox Valley. In 1949 he joined the St Mary River Irrigation Project, under the Canadian Government’s Prairie Farm Rehabilitation Act. Bill married a nurse from Calgary, Winnifred Claire Thorpe, in 1953, and settled in Lethbridge to raise a family. In 1965-66, they traveled to Ghana, where he advised and taught for a federal water management development project. He spent the ’70’s as a specifications writer and dam inspector for Alberta Environment. Bill was introduced to photography by his mother as a youngster – a skill that proved useful throughout his career and became a life-long hobby. He was fascinated by unique southern Alberta topography stretching from the foothills to Milk River and the Sweet Grass Buttes. Wherever twisted trees, wildflowers, sage, rock outcrops or history abounded, Bill could be found with camera and walking stick. After the war, Bill and his dad purchased a motorcycle and sidecar, another longstanding hobby. Bill had three big bikes over the years, touring solo and with his kids, on their own machines. He was pleased that both his granddaughters could continue the tradition. Retirement years in Vancouver were filled with photography, travel and home life. Bill was deeply saddened by Winnie’s sudden death in Sept 2011, after 58 years of marriage. He returned to sunny Calgary, where he was visited by family and spent weekends exploring the haunts of his youth. Bill resided at Col. Belcher Veterans’ Care Centre until his death following a brief illness. He is survived by his son Michael (Karen) and granddaughters Emily and Shauna, and three daughters–Kathleen, Patricia and Margaret (Ben Thorkelson). Bill requested cremation; in lieu of flowers, donations may be directed to Salvation Army or a charity of your choice. A joint celebration of his & Winnie’s lives will be held in Calgary, at the Malrborough Park Community Centre, June 29, 2013.